Daniel J. Davis is a writer and veteran living in North Carolina. His short fiction has appeared in Writers of the Future Volume 31, Galaxy's Edge Magazine, and Flame Tree Press' Swords & Steam anthology. He blogs about pulp fiction, gaming, and other related interests at www.brainleakage.com. They tell me a Texican named Robert Ervin Howard started it. I disagree; I think an Achaean named Homer did. The above quote comes from Andrew J. Offutt's introduction to the first volume of his superb Swords Against Darkness series. With what would have been Howard's 113th birthday coming up tomorrow, I can't think of a more appropriate quote to remember the man by. What Howard did with his fiction was distill the proud, heroic tradition of works like the Iliad and the Odyssey into pulse-pounding, blisteringly-paced novelettes, novellas, and shorts. Nowhere is this more obvious than in his two most Homeric stories, "Spears of Clontarf" and "The Grey God Passes." 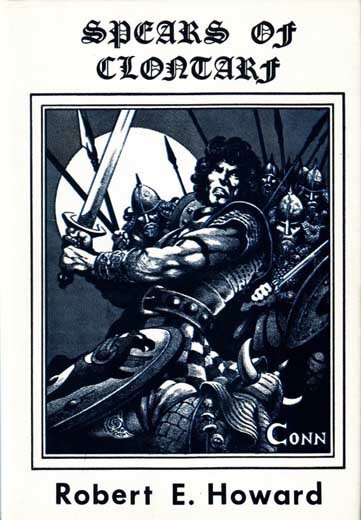 Probably written sometime in 1931, "Spears of Clontarf" is a historical fiction tale about the 1014 Battle of Clontarf, which saw the age of viking rule in Ireland come to a bloody and violent end. After the story was rejected from several historical adventure pulps, Howard re-wrote it as "The Grey God Passes," hoping the addition of supernatural elements might get him a spot in Weird Tales. Neither version was published in his lifetime. I've written elsewhere about the connection between historical adventure and sword and sorcery. And studying these two stories through that lens does provide some fascinating insights. The basic plot of both tales is the same. Exiled Irishman Conn escapes slavery under a viking warlord in Orkney, and makes his way by sea to Dublin. There, he pleads his case before the High King Brian Boru, the very man that exiled him, asking for a chance to die fighting the enemies of his people, rather than at the end of a hangman's rope. Boru accepts, and Conn takes his place in the army beside Brian's eldest son Murrogh, eventually cutting down the same viking that captured and sold him into slavery. The added magical elements in "The Grey God Passes," however, aren't just window dressing. They change the story substantially. Not the events, which play out more or less the same. Rather, they change the scale of the events, giving them an almost mythical weight and depth. 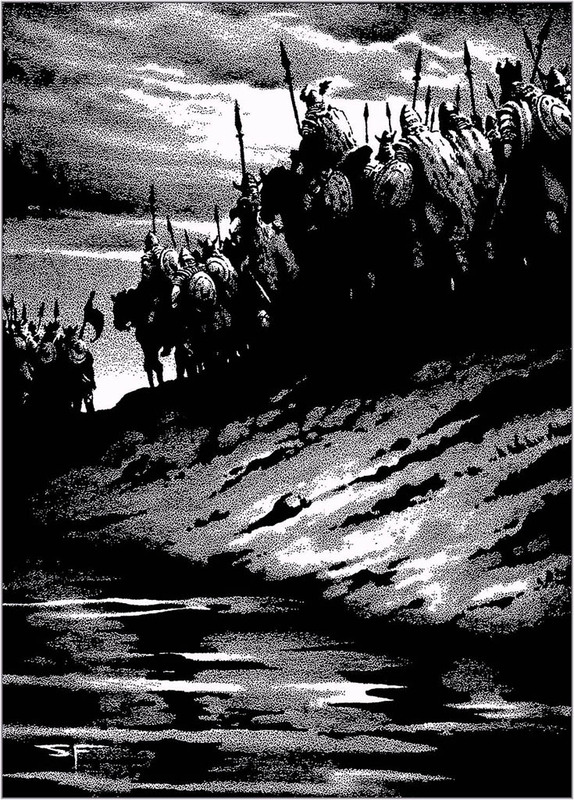 For example, prophesy—a minor plot point in "Spears of Clontarf"— takes a more significant role in "The Grey God Passes." The character of Eevin, one of Howard's dark-skinned Picts in the first story, is revised into an explicitly supernatural creature in the second tale. Now she is one of the Tuatha De Danaan, the pre-human, fairy-kin race that once ruled Ireland. It's a small change, but an important one. Eevin's visions of doom and death in "Spears of Clontarf" rightly come across as the fears of a lovestruck young girl the night before she sees her man off to battle. The fact that they're proven right speaks more to the savagery of the fight than it does any supernatural gift. But in "The Grey God Passes," with the added element of her supernatural heritage, Eevin's prophesies take on an uncanny weight. When she foretells not just her lover's death, but King Brian Boru's, she feels less like a frightened girl and more like a messenger of the gods. It's a striking difference, especially considering that much of her dialogue is unchanged from the previous version. 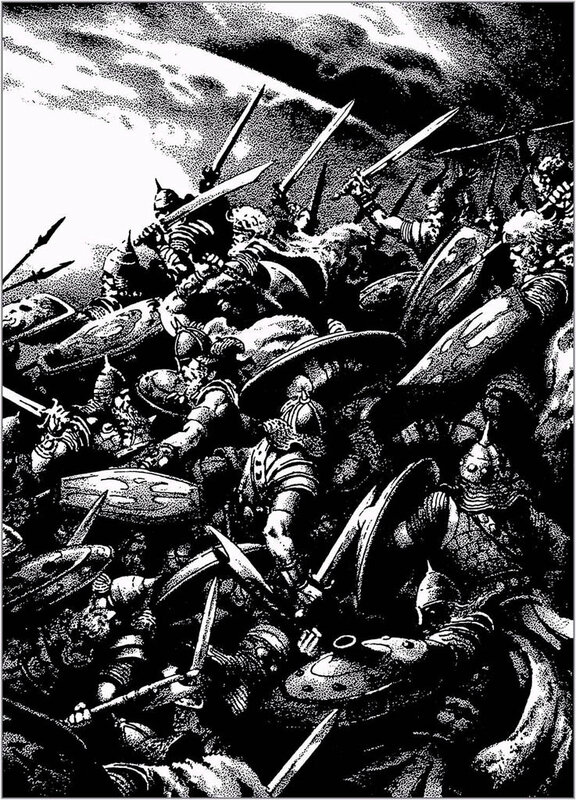 Howard explicitly invokes Ragnarök in both versions of the tale, using the comparison to highlight the brutal and apocalyptic nature of the battle. It's just a metaphor in "Spears of Clontarf," but in "The Grey God Passes" it becomes something much more literal. Odin himself appears at several junctures, including one of the story's climactic moments, when he makes good on his earlier threat to take the life of King Brian Boru's son. In the "Spears of Clontarf" version, Prince Murrogh dies in the chaos of the battle, just one of many Irish heroes to fall. Locked in single combat with Anrad the Dane, an exhausted Murrogh plunges his sword into the viking's body. Dying, Anrad musters the strength for one final act. He drives his dagger into the Irishman's heart, killing the prince and robbing the winning side of one of its brightest champions. In the revised version, though, Anrad's strength deserts him as he draws the dagger. The viking's arm sinks to the ground, and he knows his last act of defiance will come to nothing. Just then an unseen hand grips his wrist, and finishes the strike for him. The dying Murrogh then looks up to see the grey-clad form of Odin towering over him, invisible to the surrounding warriors. This moment is an example of what I mean when I describe these stories as Howard's most Homeric tales. This "cheat" by one of the gods calls to mind similar incidents from the Iliad, such as Athena retrieving Achilles' spear for him during his fateful duel against Hector. Howard uses other Homeric devices, too, like pausing to name the various kings and chieftains present, most of whom have no effect on the narrative. It's a deliberate flourish uncharacteristic of Howard, whose lean, economical storytelling style normally ensured every character and action was vital to the plot. The battle descriptions are also somewhat removed from Howard's usual blood-pumping, visceral style. Rather than following one or two of the combatants closely, Howard hovers over the action, giving short, vivid descriptions of individual duels and contests. In the space of a few paragraphs, Howard will describe the last moments of an Irish hero, then the quick and sudden death of a viking, before returning to one of the story's principal players. Through his deft use of these devices, Howard manages to give the illusion that we're reading a millennium-old epic, an Irish Iliad. It's a stunning achievement, made all the more stunning when one realizes Howard's tale clocks in at a short forty pages. Critic Damon Knight once made the half-assed assertion that "the human race has never produced and never could produce such a man" as Howard's Conan. I say anybody who believes that has obviously never heard of Arminius, Miyamoto Musashi, or Audie Murphy. The fact is, there's a damn good reason so much of storytelling throughout human history has focused on men like Achilles, Hector, and Brian Boru. A society with a heroic tradition is a society that produces men capable of heroic acts. There's a primal, almost intrinsic need for these stories. It's a need that few writers understood as well as Robert E. Howard.